holy moly. my husband would DIE if i brought this to the table. reminds me of my friend’s beer cheese soup. so, so good. i’ve got a few bottles in the fridge and need suggestions of foods to make with them. help? one tecate. an agave wheat. a honeysuckle white(? i think)? I’m not a fan of Tecate, too bland for my taste. Although I would choose it over a Corona. But the Agave Wheat would make excellent biscuits, and for the Honeysuckle Wheat (from Coronado, I think), maybe a caramel sauce or pancakes. I have a weakness for garlicy cheese dips with green onion! 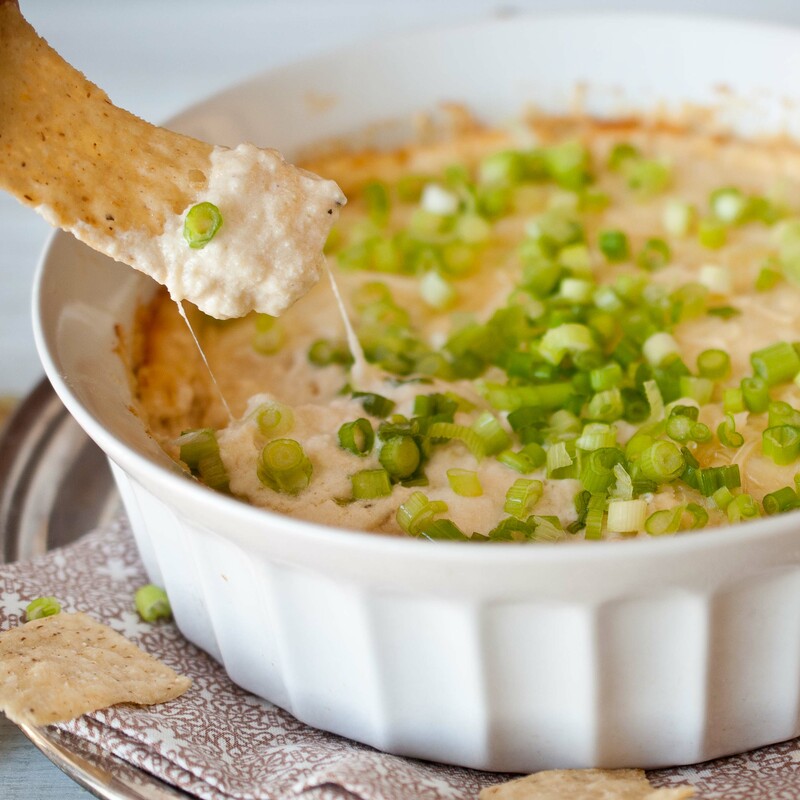 I come across this all the time in your recipes, but I never thought to add beer to change up a cheese dip…Brilliant as always! I’d probably smear this dip all over flatbread or consume a whole bag of chips just to get more of the dip in my mouth. Addicting, I tell ya! 🙂 Have a fun 4th of July! Oh my goodness, yum! I can not wait to try this one. Really?? That makes my day :)and I am very impressed that you harvested your own garlic. I can never use enough roasted garlic… I just can’t help myself. This dip looks perfect for my garlic obsession! I spottend your dip on tasty kitchen and boy, does that look good! It has some of favorite ingredients in their too such as parmesan ( all cheese really) and garlic. I haven’t been doing a lot of cooking or baking with beer but now that I discovered your blog I think I might just change that. Looks so good! I am making this now. Unfortunetly I have no access to the colaberation beer. I am using Magic Hat’s Not Quite Pale Ale… We will see. Do you have any other suggestions for other beers that would work well in this recipe? Sure! Look for a Saison with herb or citrus notes. While I am a beer guy, I am not really familiar with sasions that much (just tried my first one the other day, actually). Just out of curiousity, can you recommend any other styles of beer that you think might work in this dip? You mentioned citrus, so I am wondering if you think a hefeweizen would work well in it. A Hef would work great. I really like Saisons but they’re a little harder to find. Look for something with floral, herb or citrus notes and that isn’t too high hop. After trying another beer and cheese dip a few months ago that failed (which hardly seemed possible), I made this tonight, and it’s one of the best things I’ve ever eaten. Spreading the link around! To be honest, I had two failed attempts at it over the years. That’s what inspired the “blend and bake” method, and the cornstarch. It just seemed to separate too easily on me and I didn’t like that. I’m so glad you liked it! Where do I even start? I made this with a lemongrass saison that I brewed. everyone that came over for our get together we had tonight was absolutely astounded by this dip. We had it with tacos al pastor and the dip totally stole the show. My friends are very impressed with your palate to create such amazing recipes! I can’t wait to try everything on your site! Just made this for a party – very tasty but WOAH NELLY was it garlicy and oniony. I recommend making this only if you can avoid contact with humanity for a few days. And are really secure in your marriage. And not actively trying to have a baby. This dip looks incredible. I’m salivating as I read! I love cheese dips and I love beer. This is my first time visiting your site and I have to say you might be the smartest woman ever… a blog with beer in every recipe?! Genius! Thank you for sharing your recipes. I look forward to trying this one and others like it! I literally shouted out loud when I just saw this on Pinterest and made my husband almost jump out of his seat! LOL. He was like “WHAT?? ?” I said “Roasted Garlic & Parmesan Beer Cheese Dip.” I mean, what is NOT to love about that combination??? Oh gosh, the possibilities are endless for the beer choices here. We live in Micro-Brew Central Oregon. I’ll go look for a citrus beer for this. Thanks so much! Can’t wait to bring it to a football party. You can definitely see your enthusiasm in the way you write. The world hopes for more passionate beer girls! Great blog, I love it. i assembled this roasted garlic parm beer dip last night for tonight & realized that the ingredient list called for 1 1/2 C parm + 1/4 for the top. Down in the instructions though, it said to mix in 1 C + 1/4 C for the top. Which measurement is correct? Thanks. BEST DIP EVER! It is now a staple in my house on Game Day! I made this dip for a family dinner and everyone loved it! So much, that they barely had room for dinner. I’m trying this tonight as sauce for macaroni and cheese, using Long Trail (one of my favorite beers). I made this dip for Christmas Eve and it was a huge hit! I used Franziskaner because I had it in the fridge and I think it worked well. I plan on making it again for the Super Bowl with a saison and will probably double or triple the sriracha. I didn’t really get any heat from 1 tsp. And thanks for turning me onto sriracha! I’m from Buffalo and a devoted Frank’s girl but that sriracha has tasted great on grilled cheese sandwiches, quesadillas, and scrambled eggs. Great blog! I’ve used fresh shredded and fresh shaved, both work fine but fresh shaved seems to have a slightly better consistency. This dip looks so good! Could I make it the night before and pop it in the oven right before I serve it, or would it taste weird (maybe from the beer being exposed so long)? I think it would be fine, but I would definitely not bake it until you plan to serve it. But I think to make it up that point and refrigerate it, I think the flavors actually get better if they chill in the fridge overnight. This was really, REALLY exceptional. I served it with some toasted naan and it received rave reviews. I am not one to measure carefully, so I expect that I probably went over on the Gouda and under on the parm. The IPA flavor was just enough….delicious alongside some Bells’ Two Hearted. I was wondering about how long do you put it in to bake? I’ve had it in for 40 minutes and it’s still not golden brown and it seems to be kinda liquidy still. My husband suggested to broil the top, but I want to get the consistency in the last picture! Great recipe though, we are both so excited to make it!!! Does your oven run a bit cold? If you haven’t done an oven temp test (just put an oven thermometer in your oven and check if them matches what your oven says) that might be the problem. I’ve made this several times and it always browns up. But, it’s not crucial. I usually stir it after it gets out of the oven anyway, you just want to make sure it’s all warmed and has an even consistency. i don’t have a food processor. can i use a blender or a magic bullet instead? my friend made this dip for a bbq last weekend and i fell in love. soooooo good. Yep! Blender will work just fine. So glad you liked it! I’m looking for a beer cheese dip for my new Fondue set…. Would this work as fondue ? I think so, beer cheese is basically just a fondue with beer instead of wine. Add more beer to thin it, if desired. I also have a recipe called Fool Proof Beer Cheese Sauce that would probably work better for a beer fondue. I am in the middle of making this dip… and just a bit concerned.. just waiting for the garlic to cool a bit but the consistency is very thin pour-like.. is that how it should be …? I tried to use my magic bullet and lost some of the beer so just tried to estimate how much I lost and then put everyrthing in the blender…hoping I didn;t put too much liquid.. or will it thicken when it warms in the oven..
PS my house smells heavenly… !!! What is the yield on this dip, and how would you describe the texture? Super chunky, or smooth like nacho cheese, or what? Thanks! Pingback: What to eat during the 5th snowstorm of the year? | A Girl Named Bong…..
Pingback: The 20 Best Beer and Cheese Recipes on the Internet | Everyfoodrecipes, cooking tips, and how-to food videos—all rated and reviewed by millions of home cooks,make the perfect birthday cake, or plan your next holiday dinner. Making this tonight for the 80,000th time! Just wanted to come rave over how much I love this. I bring it to almost every party I’m invited to and on the (rare) occasion I show up without it, I get this look like “It’s still in the car, right? Please tell me you’re going out to get it..” I’ve even used gluten free beer in it a few times — you really can’t go wrong with this! Oh my goodness – yummmmmmmmm!! I am dying to try this. The pictures look phenomenal. What a treat! Any suggestions for how to make this ahead of time and then reheat at party time? Would I actually have to bake it first or would just heating it in a microwave, crockpot or fondue pot be sufficient? I’d make the entire thing, cover and refrigerate until ready to use. It’s actually better if you make it a day ahead. A crock pot on low should be fine (allow at least an hour for it to warm up. Great recipe! I slightly modified this, kind of a combination of this dip and your Beer Cheese and Bacon dip and it won 3rd place (out of 21) for a dip contest. I halved the parmesan and replaced with cheddar and added bacon. Delicious! This looks delicious!! I am planning on making it for Christmas Eve. Any suggestions on what type of chips or crackers to serve it with? Can’t wait to try it! Chips, multi seed crackers and rye crackers are good. I also like pita or naan bread.